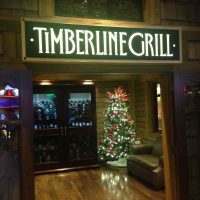 Last Christmastime, my husband and I had the great fortune of dining at the Timberline Grille in Blackhawk, Colorado. We were treated to a delicious steak dinner, and then we did our best to conquer the casinos. We didn’t exactly conquer it, but we did have a great time with friends. If you ask me, that trip was the first of many to come. I do love traditions! Before even arriving at Timberline Grille, of course, I scoped out the menu, and I was delighted to see so many delicious sauces on the menu. When it came time, I opted for the top sirloin with mustard butter, and my hubby chose the ribeye with Timberline’s signature T-1 sauce. The Saucy Dipper is no stranger to butter (see: shrimp butter recipe and corn butter recipe). It looks as though I have an affinity for it. And that’s exactly why I made my own white wine mustard butter sauce at home a few weeks later. 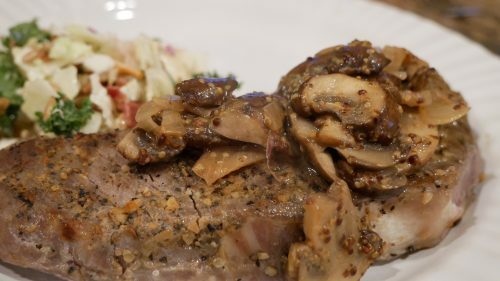 We drizzled it atop mushrooms and a steak made in our new sous vide cooker. I simply sauteed shallots in salted butter, then simmered in white wine and finished by adding in 2 tbsp. of dijon mustard. This was quite different than the sauce at Timberline, but I hit all flavor notes I was after.